The future will be smart, and the sheer amount of products in the market support that theory. While we all find ourselves mostly focused on the big products from the big brands – mainly the smart home speakers from Amazon, Google, and Apple – there are lots of other products being released from long-term smart tech companies, as well as new, start-up brands. Here are just a small sampling of some upcoming smart home products to consider as you use technology to build your custom home. Nokia is not a new name in technology, but it’s sleep pad is new. Smart sleeping hasn’t blown up yet, but it does seem to have a bright future (if for no other reason than how interested we are in studying sleep). This pad will allow users to record their sleeping habits, which can then be analyzed and, if wanted or needed, changed. The pad fits underneath your mattress, and the information it tracks – including your sleeping cycles and snoring habits – can be viewed on the accompanying app, called Health Mate. The device does have IFTTT functionality, which means it can be integrated into your other smart products, like your thermostat and lights. Look for this product to be released in the last half of the year. Automatic window cleaners are a dream come true for busy people (and, I suppose, for lazy people too). These “robots” suction to your windows and runs through cleaning cycle where it cruises along your glass. Your glass patio doors will be so clean that they will be a hazard! The Winbot X, from Ecovacs, was present at CES 2018, and it did not fail to impress. This unit, unlike its competition, has a rechargeable battery, which allows it to clean your dirtiest glass without a cord, and without having to stop for a charge. It’ll cost you a pretty chunk – over $400 – but could definitely be worth it. Keep this product in mind for the holidays, as it should be out before the end of the year. I’ve seen some smart mirrors before, but they have yet to really take off in the mainstream smart home industry. There’s a new product on the market that hopes to change that, though. The Kohler Verdera Voice Lighted Mirror has all the elements of a connect morning: it’s a mirror, it’s lighted, and it connects to Alexa so you can get your news and weather, or rock out while you’re in the shower. Tetra is all things trendy: smart home technology and conservation-focused. This countertop dishwasher is compact, and meant to take washing dishes to an all new eco-friendly level. 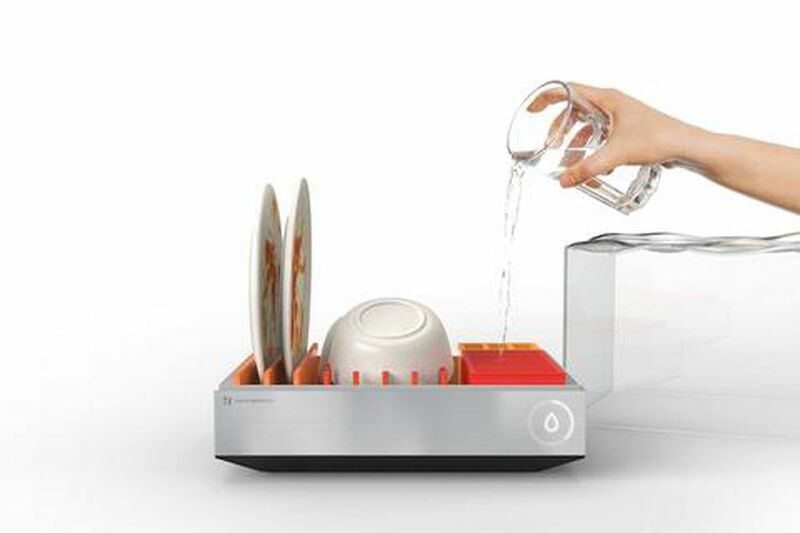 This device holds two place settings’ worth of dishes and silverware, and uses just over two liters of water during its 10 minute cycle. Of course, it has an app that you can use on your smartphone to control all things clean, from your pressure levels to your cycle times, and you can even start the device remotely. This device is a cool $300 and will be available later this year.